Colgate's setting - its extraordinary combination of our Hill and our expansive lower park - has long been one of its greatest assets. Few institutions enjoy a setting of comparable beauty or one of comparable challenge. This exhibition will show how architects and planners have helped us imprint our aspirations on this special place. Almost one hundred and fifty years ago, we invited F. L. Olmsted, the designer of Central Park and the greatest landscape architect of his age, to advise us on the management and improvements of the "grounds." And since his visit we have relied on a parade of prestigious landscape architects and campus planning firms to help us adapt the potentials of the campus to our evolving ambitions. We all know that Colgate has been shaped by its position in the Chenango Valley. The campus plans on display in this exhibition will reveal how Colgate has also sculpted this place, giving form to our distinctive institutional spirit and to our visions of ongoing educational excellence. 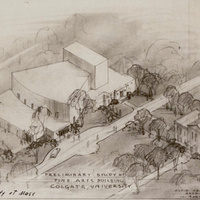 Preliminary Study of Fine Arts Building, 1949. Earl Purdy '15 of McKim, Mead and White.